That might be the most important lesson that I picked up from my years of working with Steve Sjuggerud. Steve touched on this idea on a recent episode of the Stansberry Investor Hour podcast: "They typically end with an extraordinary period of, to quote [former Fed Chairman Alan] Greenspan, 'irrational exuberance.'" Time and time again, we've seen investors get greedy and euphoric right before the bubble bursts. We saw it leading up to the real estate bust, when investors expected housing prices to soar 20% a year, even when incomes and populations were barely budging. We all know how that turned out. We saw it again as recently as last fall, as cryptocurrencies like bitcoin became the only thing people could talk about at holiday parties. 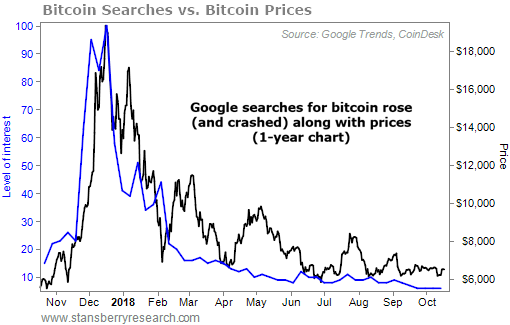 As you can see from the following chart – which plots Google searches for bitcoin alongside bitcoin prices – folks were searching the word "bitcoin" more than any other time in history. What can the bitcoin bubble teach us about the market today? Well, when the dinner table is abuzz with stock discussion... or your cab driver is pitching you on "FAANG" stocks... or your friend quits his job to day trade in his brokerage account... that's when we'll be close to the eventual top. But we aren't there yet. People are not acting irrationally yet. Instead, they're worried. They're worried about the recent correction in stocks. They're worried about valuations. They're worried about "trade wars" and politics. At some point, they'll stop worrying. When that happens, they'll buy with reckless abandon. Valuations won't matter. They'll see a fall in prices as a buying opportunity. The only worry will be missing out on the huge gains their friends and family are racking up in the markets. That's what happened during the last "Melt Up" peak. And that's what it will feel like this time around, too. Again... we aren't there yet. Last weekend, he explained why the recent pullback didn't change Steve's thesis. And in the past month in the Digest, he has also showed why an additional 10%-15% pullback from today's levels wouldn't be unusual... and shared several other bullish market indicators. Steve and I have covered it frequently in our free and paid services, as well. We continue to discuss it because we know many of you are wondering when and how this bull market will finally end. As Stansberry Research founder Porter Stansberry often says, we're simply doing what we'd want from you if our roles were reversed. Some may say we've gone overboard with our Melt Up coverage... But you need to be informed about the market's latest movements, especially now that we're almost a decade into this bull market. The last Melt Up during the dot-com bubble saw the price-to-sales ("P/S") ratio for the tech-heavy Nasdaq stock exchange rise from 1.5 in 1998 to nearly 6 in 1999 before the market finally peaked. And amazingly, valuations for many of the Nasdaq's top holdings were ridiculous even before the final run-up. Microsoft was priced at a ridiculous 17 times sales when the last Melt Up began. Its valuation increased nearly 60% from there. Qualcomm went from being cheap (at 1.3 times sales) to a true bubble valuation of 27 times sales. Only one of the Nasdaq's top holdings – WorldCom – saw its P/S ratio decline during the Melt Up. Many Nasdaq stocks saw their P/S ratios increase by multiple times – and they eventually reached crazy levels. This tells me that today's Melt Up is nowhere near over. Valuations are high... But they're nothing like those of the last Melt Up. And that's one reason why Steve and I believe stocks can still soar dramatically from here. Folks have a hard time hearing us out on this, though. They look at Steve like he's crazy when he says stocks are actually cheap. If we look at the numbers, it's easy to see that this isn't the case, either. Everyone knows that stocks have gone up for almost 10 years now – without a losing year. So it would be crazy for stocks to be cheap today, right? Let me share one number with you: 13.8. That's the price-to-earnings (P/E) ratio of the U.S. stock market, based on analyst estimates of stock market earnings over the next two years. This is also known as the two-year forward P/E ratio. This, my friend, is a low number... It's lower than its average value, going back 22 years. Specifically, analysts expect corporate earnings to grow from 138 this year to a whopping 197 by the end of 2020, two years from now. So when we look at the P/E ratio, if we leave the "P" the same, and we plug in those future numbers for the "E" – we end up with a radical result: Stocks are below their average value since 1996. Corporate earnings have been growing consistently for years. Then, we saw a huge bump in earnings thanks to the tax cuts from President Donald Trump. This growth should continue, meaning stocks will grow into today's seemingly high valuations. Simply put, this expensive market is actually cheaper than almost anyone believes. If you know when a recession is coming, you know when a stock market crash is coming. 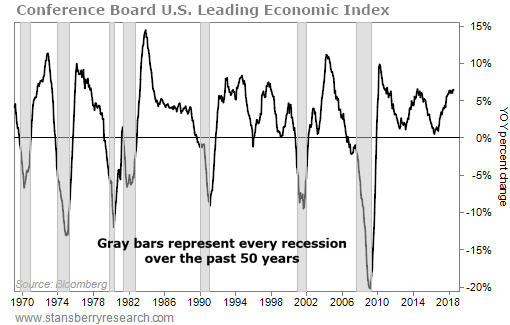 And the Leading Economic Index ("LEI") from independent research group the Conference Board has an incredible track record for calling recessions. This indicator has successfully predicted every recession dating back 50 years. The Conference Board's LEI for the U.S. looks at 10 different economic indicators, including employment, housing, and rates. Take a look at the chart below. It tells the story. Every recession of the past 50 years happened after the year-over-year percentage change in the LEI index went negative. As long as economic indicators like the LEI remain in good shape, the Melt Up can continue. When they start to fall, that's when it's time to worry. But we're not seeing those warning signs yet. As we noted in Thursday's DailyWealth, last week's mini "crash" in stocks triggered a rare extreme. The benchmark S&P 500 Index closed lower in six straight sessions – from October 3 to October 11. This is a rare event that has only happened 1% of the time since 1950. History proves that owning stocks for the long run works. They've returned roughly 8% a year (not including dividends) since 1950. But buying after a string of down days has performed even better. Similar instances returned 3.5% in three months, 5% in six months, and 11% over the next year. These are impressive returns and solid outperformance. So sure, I know the recent fall feels scary... But history says we shouldn't hit the panic button just yet. A double-digit rally is likely as U.S. stocks bounce back over the next year... And the Melt Up Steve has been calling for since late 2015 is still a "go." As you've surely heard by now, Steve is holding a special broadcast event on Wednesday, October 24, to cover the latest on his Melt Up thesis. During the event, he'll share a major prediction he hasn't revealed anywhere before... He'll address all your most pressing questions and concerns... And he'll even give you the name and ticker of one of his favorite Melt Up recommendations – a stock he believes could soar 1,000% in the months ahead – just for tuning in. Click here to reserve your spot now. And even better, he'll reveal the name and ticker of a company with the potential to return 1,000% in the next year – absolutely free – to everyone who attends. Sign up right here.